This collection of practice worksheets has been categorized based on place values. 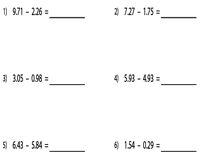 The step by step approach ranging from single to three-digits will fine-tune the skills of the 4th, 5th and 6th graders in subtracting decimals horizontally. An in-depth understanding of decimal place values is a prerequisite. 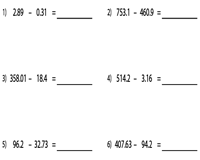 This set of worksheets deals solely with the subtraction of decimals in a row (horizontal) containing the decimals with tenths place value. 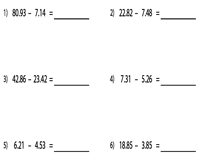 The worksheets are subdivided into three levels based on the whole part of the decimals. An assemblage of printables featuring exercises with a mix of numbers ranging from single to triple digits in the whole number part to help you assess your knowledge. 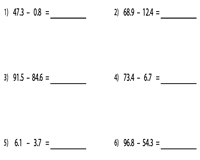 Raise the bar with these worksheets consisting of numbers with an additional decimal place value. Arrange them, add zeroes for any missing place value and subtract as usual. Attempt another set of mixed number worksheets where the number of digits in the whole number part varies. Follow the same process to subtract the decimals horizontally with an additional place value-thousandths. 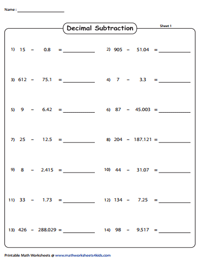 Review your understanding and assess your skills with these worksheets featuring exercises to subtract decimals horizontally with mixed decimal place values. 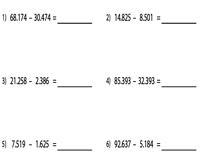 Practice these worksheets to master horizontal decimal subtraction irrespective of the number of digits on either side. 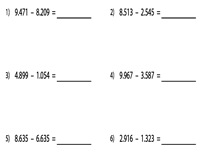 These worksheets require students to subtract the decimals from whole numbers. The problems are arranged in a horizontal format. The whole numbers and decimal values are offered up to three digits.